Color words are a fun way to work on reading skills. 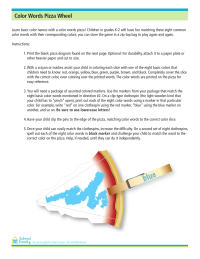 Try these worksheets and games on reading, writing, and identifying the common colors that many children will encounter early on. Find more help and ideas on our Building Reading Skills resource page. Make school supply list shopping easy! Help your child learn the basic color names with this Pizza Wheel activity. Children in grades K-2 will have fun matching these eight common color words with their corresponding colors. 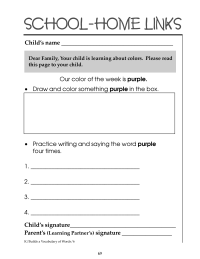 Kindergarten worksheet to practice identifying, reading, and writing the word purple. Created by the U.S. Department of Education. 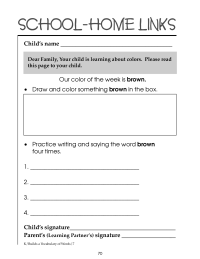 Kindergarten worksheet to practice identifying, reading, and writing the word brown. Created by the U.S. Department of Education. Kindergarten worksheet to practice identifying, reading, and writing the word yellow. Created by the U.S. Department of Education. Kindergarten worksheet to practice identifying, reading, and writing the word blue. Created by the U.S. Department of Education.